What is osteochondritis dissecans (OCD)? Osteochondritis dissecans describes an uncommon disorder affecting the bone and cartilage surface of the elbow joint. This can lead to damage to the joint surface and the creation of cartilage and bone fragments. It occurs as a result of altered blood supply to the joint surface in the elbow. This may be due to overuse in sports such as gymnastics or overhead throwing sports. It most commonly occurs in adolescents. The reduced blood supply to the joint causes the bone to develop avascular necrosis (local bone death), which can cause loosening and damage to the overlying cartilage. This loosening may lead to some fragments becoming partially or completely detached. If they separate then this can cause further symptoms. Pain is a common feature of this disorder, especially when bending or straightening the elbow. There may be tenderness close to the area of cartilage damage and there may be an inability to fully bend or straighten the elbow. If a fragment has become detached, this can cause symptoms of catching or locking within the elbow. The diagnosis is determined by the symptoms and signs in the elbow combined with special imaging investigations. 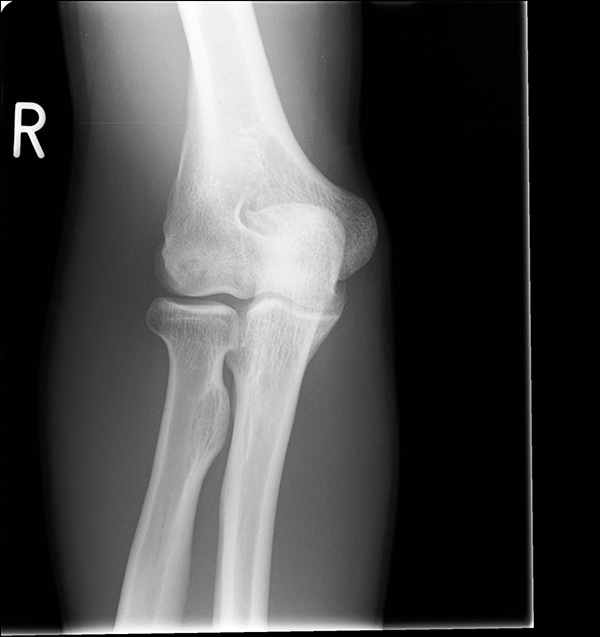 An X-ray can pick up signs of bone changes and large loose fragments. An MRI scan is more sensitive in picking up signs of OCD and can also offer some clues as to the nature of the remaining blood supply and potential for any healing. In many cases, simple rest, analgesia and avoidance of certain activities are all that is needed. In cases where there is near complete or complete detachment of the bone and cartilage fragment, surgery may be required. This can be done via keyhole (arthroscopic) techniques, open surgery or a combination of the two. The complications of surgery include infection, bleeding and nerve injury. If the OCD does not heal there can be progression in the disease with the osteochondral (bone and cartilage) lesion can detach from the surrounding bone, pain and clicking usually follow this.